Leave it to ThinkGeek to deliver some of the best geeky toys inspired by your favorite video games. 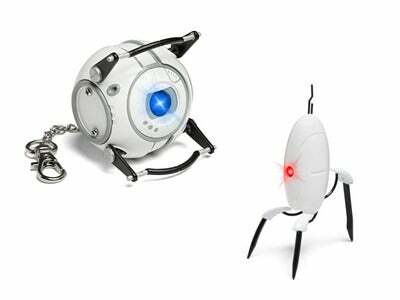 If you happen to be a fan of Portal, you might love these officially licensed LED flashlights modeled after an Aperture Science turret or Wheatley from Portal 2. No detail is spared with these flashlights. While the turret will not shoot you if you get into its line of sight, it will light up and say a random quote such as "I don't hate you" or “Target acquired" when you press its button. The classic red color emanates from the turret’s eye. Wheatley boasts moveable handles and shines his blue light from his eye. To add get your hands on a mini turret, it will set you back $25. Wheatley is slightly less, at $20. Both are small and would fit nicely on any keychain. While I find these both awesome and adorable, I secretly want much larger versions; because what my apartment is really missing is a turret lamp.